Among the women whose solid work built Atlantic Records, LaVern Baker gave Atlantic enough crossover appeal before Ray Charles stormed into the Pop Top 40 at the end of the 1950’s. Starting out as Little Miss Sharecropper (a parody of Little Mrs. Cornshucks/Mildred Cummings) in 1949, LaVern charted a career of nearly 20 years of recording, many of them being chart entry years. She’s one of the architects of soul, so we pay tribute to her on her 86th Birthday. Hitting her stride in the Mid 50’s, like Ruth Brown, she was a definite bridge singer between Jump Blues and Smooth R&B. The evolution of her material through the late Fifties and into the 60’s mirrored that transition as she went from Top 40 hit to hit between 1955 and 1962. Unfortunately, for all of her hard working efforts, as the 1960’s blossomed and younger singers rose in prominence, the now 30-something Baker found herself adrift in the concerns of the record label she helped bring to national prominence. 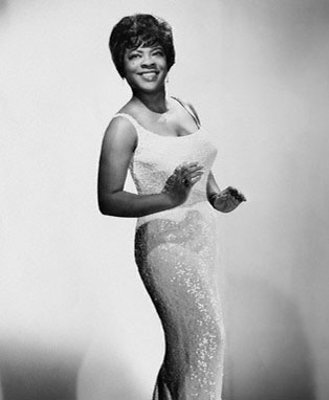 Her final release for Atlantic records at the beginning of 1965 had promise. Her half Spoken Word-Sung version of “Fly Me To The Moon” both made the R&B Top 40 and the Pop Hot 100. Delightful in its spoken word passages and strumming guitar, it deserved even better status than it achieved in 1965. For whatever reason, LaVern and Atlantic decided not to capitalize on any success. Baker found herself at Chicagoland label Brunswick next, finding some success with Jackie Wilson as a duet partner. Not long after, she’d find herself being a USO Base Entertainment Director for 22 years (appropriate that we’d celebrate her Birthday on Veteran’s Day). Depending on which version of the story you read, it’s a fascinating detour in the life of this R&B legend.